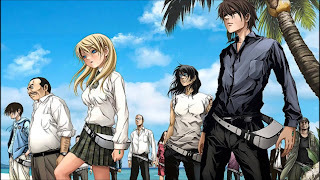 Sakamoto Ryouta is 22 years old and unemployed, but is the highest ranking Japanese player in a game called Btooom! But things change when Ryouta suddenly finds himself on an island, not knowing how or why he is there. It turns out that he and other people are in a real life version of Btoom! and the objective is simple: kill other players to gain their crystals, which you must collect 5 of in order to get off the island. The anime has a strong start, showing you some Btoom! gameplay and just how good a player Ryouta is. He then goes on to explain how the game works, so you won't be left confused as the game is played on the island. After this intro, it goes straight to Ryouta finding himself on the island and tries to recall how he got there. The anime does show flashbacks as to what happened between the time he was playing and when he arrived on the island, which are pretty interesting as you don't know what will happen next. He gradually comes to terms with what is happening on the island and slowly becomes familiar with playing Btoom! using real bombs. Because this is the main focus in the first episode, the anime is able to focus on other things, bringing more action into each episode and doesn't drag out Ryouta's transition from a helpless, confused and scared man to an experienced (real life) Btoom! player. You will also see flashbacks of some of the other characters Ryouta meets, both in-game and real life experiences, further adding interest to the story and explaining the reasons behind why they also ended up on the island playing Btoom! with their own lives. This is only a 12 episode anime with no possibility of a season 2, but it is recommended to read the manga if you are interested in what happens to Ryouta and Co after that cliffhanger of an ending.